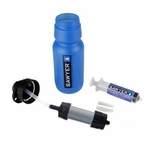 Sawyer® Point Zero Two™ Purifier with Bucket Adapter Kit: Lifetime Warranty on the Hollow Fiber Purifier! Includes: Includes: .02 MICRON ABSOLUTE HOLLOW FIBER MEMBRANE INLINE PURIFIER AND BUCKET ADAPTER KIT. Drinking Water For Remote Camps and Cabins Up to 170 Gallons of Clean Water Per Day! This Filtration System Exceeds EPA Standards for the removal Bacteria, Protozoa, Cysts, Viruses. The Sawyer® Point Zero Two™ Purifiers feature a 0.02 Micron Absolute Hollow Fiber Membrane, which uses medical technology developed from kidney dialysis. When the water is drawn through the filter, it flows through the side walls of the Hollow Fiber tubes. Sediment, bacteria, protozoa, cysts, and other contaminants are filtered out exceeding all applicable EPA recommendations. Simply follow the enclosed directions for use and affix to any bucket or pail to yield bacteria-free water in remote locations. Sawyer Products, Inc. has a NEW viral filter, 0.02 micron; no chemicals needed, rated for One Million Gallons. Handles up to 40 PSI, but flow is easy enough to drink direct orally. Low cost and high volume. Will put and end to Typhoid and Cholera for an incredibly low cost. > 5.5 log viral, fully EPA tested.